The Stars and Stripes in the Med! Enjoy an American style feast on your weekend in Barcelona. 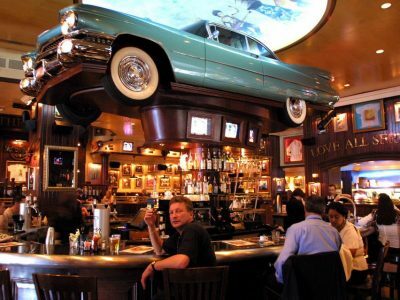 This is a world famous restaurant, specialising in everything ‘Murica. Experience the retro feel that this lively restaurant has to offer, while you enjoy a fun filled night full of laughter with your friends… Choose from a delicious set menu before you head out for a night on the town on your weekend away in Barcelona! Experience the retro feel that this lively restaurant has to offer, while you enjoy a fun filled night full of laughter with your friends… Choose from a delicious set menu before you head out for a night on the town on your weekend away in Barcelona! Fancy a more select menu? Contact your party planner and we can discuss the other options we have! Sangria and beer are the perfect accompaniment to the tapas, but be sure you’re still standing at the club – entry is at the doorman’s discretion!